CalendarX is in a league of its own. While our other tools are API solutions to help get your events on your customers’ calendars, CalendarX is its own comprehensive calendar solution. It’s an embeddable calendar, a subscription calendar, and a data collection service all rolled into one. If you haven’t yet, consider reading the doc on our Subscription Calendar tool first, as it shares a lot of functionality with CalendarX and we’ll be referencing it a number of times. Please note: this tool requires basic coding knowledge. First of all, you should only use CalendarX if you have multiple events that you want your users to be able to easily add to their calendars. The Subscription Calendar tool also allows you to do this, but CalendarX goes further. You should use CalendarX (and not the Subscription Calendar tool), if you also want to collect information from your users, or embed a calendar on your website that your users can see. As an embeddable calendar, it makes your events visually friendly for your users by giving them an actual calendar to look at on your website. Remember that humans are visual beings. Trust us, your users will love it. 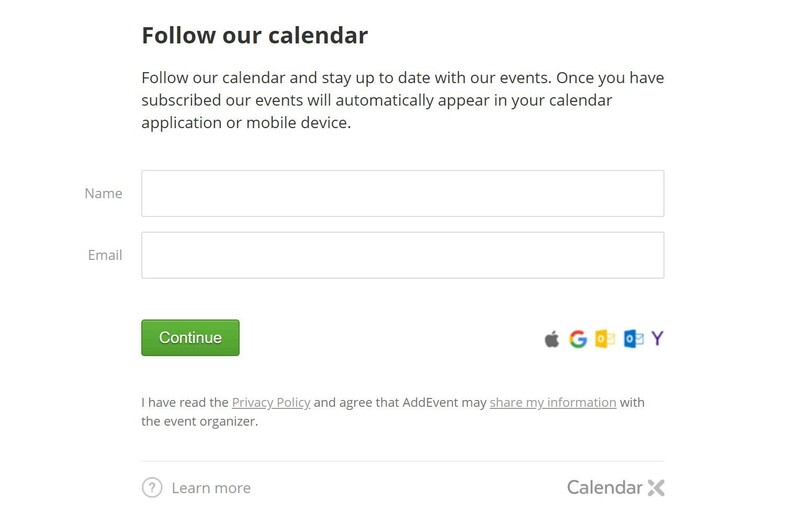 An embedded calendar is also a great way to keep your users who don’t subscribe to your calendar up to date on your events. As a subscription calendar, it allows your users to easily add your events to their calendars and stay up-to-date on any event changes (similar to the Subscription Calendar tool, though with more options and deeper analytics). As a data collection service, it allows you to collect data from those who follow your calendars such as names, email addresses, locations, and more. All this data is organized and easily accessible in your CalendarX account. CalendarX also includes its own analytics. Track active & total followers and view monthly summaries of follow button clicks, embedded calendar views, calendar requests, and more. Essentially it’s the comprehensive calendar system you never knew you needed. But now you do. All paid plans give you access to CalendarX. Go to the CalendarX tool page on AddEvent.com. Click the “Launch CalendarX” button, and you’ll be redirected to CalendarX.com. We use a separate website to make it easier for you to use this comprehensive tool. Don’t worry, it’s still part of AddEvent Inc. and your account information is the same. Now it’s time to create your calendar. You can either use our pre-built calendar or completely customize your own to match your website design. You decide who can manage the calendar, what you want to know about your followers and more. When your calendar is created, feel free to add some events now or wait until later, it’s up to you! Now let’s look at how you can use your new calendar. First things first. Embed your new calendar on your website to let your users easily view your events. When you are satisfied with the appearance and functions of your calendar, simply copy a small piece of HTML code and place it wherever you want your calendar to appear on your website. Once you’ve done this, you have three and a half great ways to share your calendar with the world. 1. Add a follow button to your website. This is exactly what it sounds like – a button that your users can click to easily follow your calendar and add your events to their personal calendars. Just like the Subscription Calendar tool, if you add / delete / edit an event on your CalendarX calendar, that change will be reflected on the calendars of your followers. When they click the button, they’ll be presented with a small pop-up window (completely customizable) prompting them to enter their information and follow your calendar. We’ve provided an example pop-up below. Remember that you decide what information to collect from your followers – here we’re only collecting their name and email address. 2. Share a link to a calendar page on social media like Facebook and Twitter or link to it in an email. This is about getting your calendar in front of your users wherever they are so they can easily follow it. 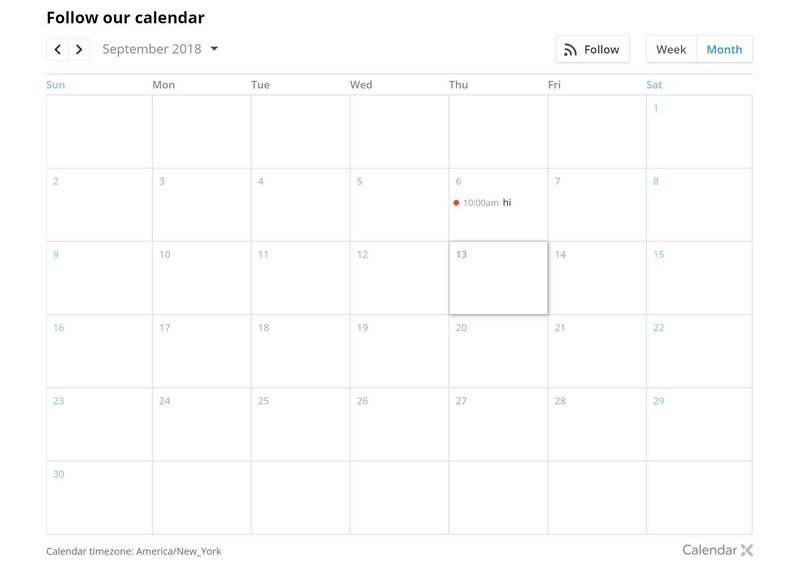 Your users simply click the link, which takes them to a calendar page like the one below (again, fully customizable) where they can view your events and follow your calendar. 3. Share a link to a follow page on social media like Facebook and Twitter or link to it in an email. This works exactly the same way as the calendar page link, but instead of your users seeing a full calendar, they’ll see a simple form like the one below. Again, fully customizable. And presto! That’s how you use CalendarX. It’s intuitive, powerful, and we guarantee your users will love it. After all, this entire tool was built with them in mind. From the initial concept to the finest details, we focused on giving your users the best possible calendar experience. Let’s take a look a how a real company is using CalendarX right now. University of California, Merced uses CalendarX to help their users keep track of monthly lunch programs. By embedding an actual calendar on their website, they’ve made it easier for their users to see when the events are. 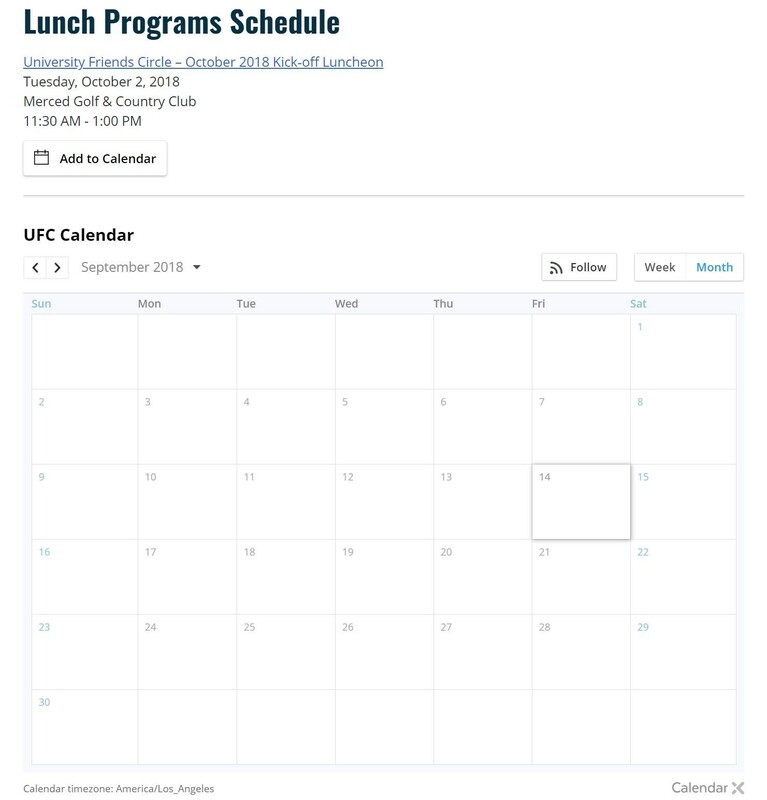 Users have the option to follow the calendar and add all the lunch programs to their personal calendars. Merced has also included an Add to Calendar button so users can quickly and easily add just the next lunch program to their calendars if they prefer. Textbook usage. 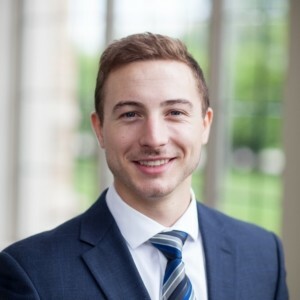 They show their users an actual calendar on their website with their events and give them an easy way to get those events on their own calendars. More events on their calendars mean more top-of-mind brand awareness for your business, and higher attendance rates for your events. Sweet. If you haven’t already, I highly suggest you sign up and try out CalendarX for yourself. It’s an amazing service that both you and your customers will love.